Network Simulator Projects are plays an important part into research scholar’s academic life. We ensure computer network projects are developed in network simulation tools for students to pass data by network computing device to each other along data connections. We transfer data in the form of packets. We provide network simulators for academic creating projects which were available in various operating systems such as Linux, OSX, sun Solaris and Microsoft windows and support parallel computing environment and also all simulation tools are open source. 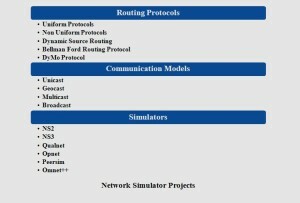 We use network simulators for developing computer network projects to model network software. Predict network protocol performance by emulation and simulation for M.Tech students. We support network simulators with various network such as cellular satellite, WLAN and mobile Adhoc network. Several network simulators are introduced to design and implement network relevant concepts. Network simulators are Omnet++, NS2, NS3, Opnet, Peersim and Qualnet. Communication models of networking are unicast, broadcast, geocast and multicast. Network management and monitoring concepts are frequently handled by these simulators and also invent new ideas and concepts into network area. Many of the routing protocols are newly created for performing easiest and simplest routing. Routing protocols are uniform protocol, non-uniform protocols, dynamic source routing, dymo protocol and bellman ford routing protocol. We establish wireless sensor network composed with large number of sensor nodes which densely deployed in monitoring region communicating over radio. This network ensures flexible and altercation with many application such as natural disaster recovery, target tracking and habitat monitoring. No hierarchy is maintained all nodes send & respond to control message at same manner. It reduces the control traffic burden by separating nodes in deal with routing information. It categorize as: protocol in which each node focus routing activity on neighbor subset topologically partitioned protocol network. It forward data as one to one communication. It delivers data to a group of node inside a specified geographical area. Ensures one too many communications. It is a reactive uniform routing protocol that uses a concept called source routing. It referred as ford futherson algorithm which uses distance vector routing protocol. It is a reactive routing protocol developed with IEFT MANET working group. It use highly detail standard based implementation of protocol model. It run on vast array platforms include window and Linux OS. It runs on multicore, multi processor system and clusters to model large network with high fidelity. It connects to other hardware & software application such as real network and OTB to enhance network model. Support real time speed to enable network emulation. Software in loop and human in loop model.